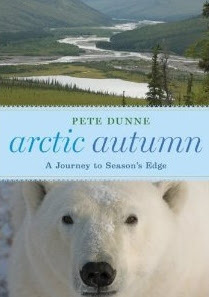 I had an enjoyable experience reading Pete Dunne's soon-to-be-released book Arctic Autumn . I have always enjoyed Pete's writing style in his BirdWatching articles, so I was really looking forward to reading one of his books. The good folks at Houghton Mifflin Harcourt provided me a copy of the advance uncorrected proof to review. I thought it was kind of cool to see a book before its final form. Very poetically Dunne captures the spirit of the arctic in his descriptions of the people, birds, animals, challenges, and even his fellow tourists of the cold north. For that reason alone, this book is worth reading. But there is so much more contained therein that enlivens the heart and mind of the reader. With pen and highlighter in hand, I read and intensely marked-up the pages to help me recall the particularly clever or charming language or noting topics of interest for further discussion. I appreciate Pete's honesty and lack of hypocrisy when dealing with subjects affecting the arctic like the oil industry, hunting, and global warming. I plan to post more about Pete's views on hunting in the future. It is the most well thought out, logically written, and both intelligently and emotionally engaging essay on hunting ever written. I hope it can be printed separately in hunting and environmental magazines as both sides will benefit from the "respect" Pete's words engender. Thanks Pete, for sharing your "perfect moment". Arctic Autumn: A Journey to Season's Edge is scheduled to be released on Sept 20th. Pre-order your copy now for just $16.15.